My NRLI fellowship class zipped across the Rodman Reservoir in two air boats, avoiding the submerged tree trunks leftover from the bottomland forest that once grew here. I visited the reservoir to learn about the environmental controversy surrounding the Rodman Dam (to remove, or not to remove), but the birds completely distracted me. There are few places I have seen with more birds than Rodman Reservoir. Air boats are not my first choice for aquatic transportation – being loud and generally disturbing to everyone and everything – but they did allow us to cover a lot of water very quickly. 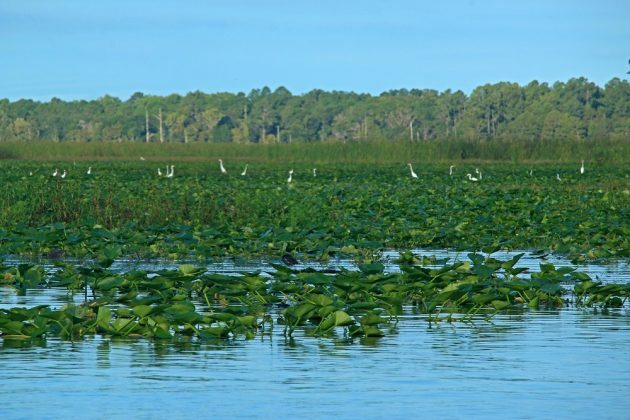 Large flocks of Great and Snowy Egrets appeared like sails against the green and blue background of the reservoir, with Tricolored and Great Blue Herons contrasted in darker plumage. 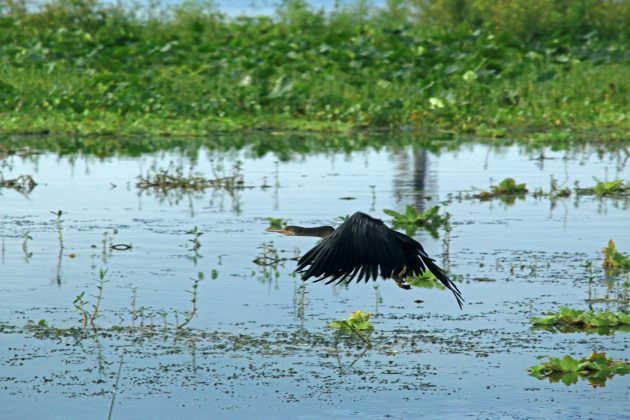 As we moved, Anhingas and Double-crested Cormorants took to the air, landing on the stripped branches of long dead trees, while dozens of Common Gallinules paddled vigorously out of our path. 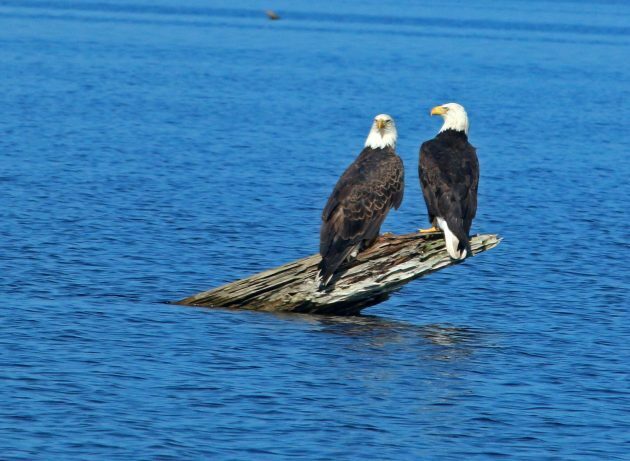 Perhaps most striking, a pair of Bald Eagles looked down on us from a snag, eventually spreading their large, dark wings over the water. Another pair (or perhaps the same two after they landed) rested on a particularly submerged log. The photographic opportunities were endless. I not only appreciated the diversity of species, but also just how many birds there were. The sky was alive with feathered flight, the large wingspans of the wading birds that much more impressive when multiple species were a-wing. The water’s surface was equally vibrant. Boat-tailed Grackles called, as usual, with the most volume, running across lily pads and aquatic vegetation. I have to admit however, that the gallinules remained my favorite. The red forehead of the adults shone in the sun, making identification easy even from afar. I’d love to visit again during the winter; perhaps it is equally covered in waterfowl! 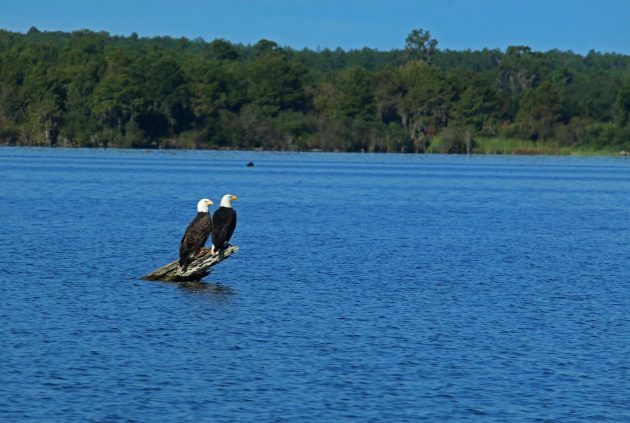 Two Bald Eagles look out over their watery kingdom. Even after spending three days studying the issue, I don’t have a clear-cut opinion on removing or retaining the dam. It’s an extremely complicated issue, a legacy of poor environmental decisions made in the past. 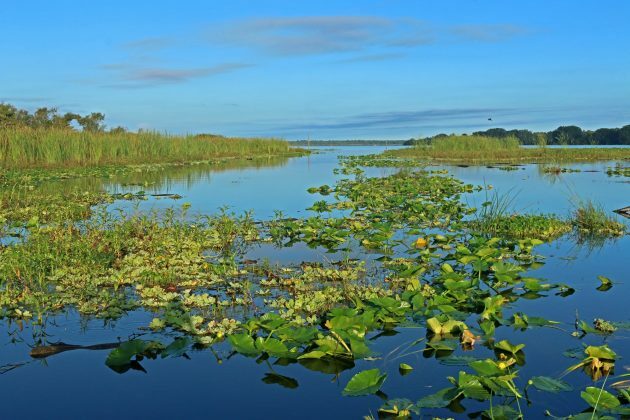 However, it is clear that the reservoir currently is a birding hotspot, and I would love to return someday – in a kayak. Rodman Reservoir in the morning. Erika, the picture of the eagles is just amazing! What a sight. Thanks for sharing with us. Who Knew Turkeys Were So Dangerous?